BACKGROUND: The implementation of treat-to-target principles in rheumatoid arthritis (RA) has not been fully investigated in patients with inadequate response to tumor necrosis factor (TNF) inhibitor treatment. OBJECTIVES: To evaluate the prevalence of an inadequate response to initial TNF inhibitor treatment at 6 and 12 months among patients with RA in a real-world patient registry, as well as the delay in therapy adjustment and its impact on disease activity and patient-reported outcome (PRO) measures. METHODS: This analysis is based on data of patients with moderate or severe disease activity (Clinical Disease Activity Index [CDAI] score >10) who were included in the Consortium of Rheumatology Researchers of North America (Corrona) RA registry, a prospective, observational database. The patients had never received treatment with a biologic disease-modifying antirheumatic drug (DMARD) and had initiated treatment with a TNF inhibitor (adalimumab, certolizumab pegol, etanercept, golimumab, or infliximab) between October 2001 and December 2014. We evaluated treatment response (CDAI score ≤10), select PRO measures, and treatment changes at 6 months. Patients who had an inadequate response to TNF inhibitor therapy at 6 months and continued to use their initial TNF inhibitor were evaluated again at 12 months. RESULTS: This retrospective analysis included 2282 patients. At 6 months, 1732 (75.9%) of the patients continued to use their initial TNF inhibitor; of these, 803 (46.4%) patients had an inadequate response to treatment. Of the 803 patients who had an inadequate response at 6 months, 488 (60.8%) continued their initial treatment at 12 months. Of these 488 patients, 315 (64.5%) had an inadequate response at 12 months, and 173 (35.5%) had a response. Numerically greater improvements in all PRO measures were observed for patients who responded to therapy compared with patients with an inadequate response. CONCLUSIONS: In this real-world analysis of data from the Corrona RA registry, a considerable proportion of patients with RA had an inadequate response to the initial TNF inhibitor therapy at 6 and 12 months. Many patients continued to have moderate or high disease activity, without accelerating treatment (eg, addition or increase in the dose of concurrent conventional synthetic DMARDs or a TNF inhibitor), contrary to treat-to-target principles, thus remaining at risk for accumulating joint damage and disability. Patients who discontinue the initial TNF inhibitor treatment because of a lack of response or because of adverse events may switch to an alternative TNF inhibitor (ie, TNF inhibitor cycling4,5) or to a non–TNF inhibitor biologic DMARD or tofacitinib. The goals of the current analysis were to evaluate the prevalence of inadequate response to initial TNF inhibitor treatment, to describe the delays in the adjustment of treatment after nonresponse to treatment with the initial TNF inhibitor, and to assess the impact of such delays on disease activity and patient-reported outcome (PRO) measures. 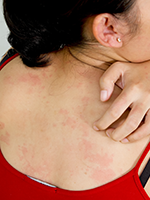 The study included biologic drug–naïve patients with moderate or severe RA disease activity, regardless of the duration of treatment, who were enrolled in the Consortium of Rheumatology Researchers of North America (Corrona) RA registry. The Corrona registry is an independent, prospective, observational database of patients with inflammatory arthritides that recently expanded to recruit patients with other autoimmune diseases, including inflammatory bowel disease and multiple sclerosis. The Corrona RA registry has been recruiting patients for more than 15 years from 170 private and academic practices across 40 US states.19,20 As of January 2, 2017, data on 44,532 patients with RA have been collected from patients and rheumatologists. This comprises longitudinal information from 337,554 patient visits and approximately 152,215 patient-years of total follow-up time. The mean duration of patient follow-up is 4.22 years, and the median time between follow-up visits is 4.90 months. All patients provided informed consent before enrollment in the Corrona registry. Institutional Review Board (IRB) approvals for the registry and the current study were obtained from a central IRB (New England IRB) for private practice sites and from local IRBs for each participating academic site. Patients were included in this retrospective analysis if they had a diagnosis of moderate or severe RA, defined as Clinical Disease Activity Index (CDAI) score >10, at the time they initiated treatment with a TNF inhibitor—adalimumab (Humira), certolizumab pegol (Cimzia), etanercept (Enbrel), golimumab (Simponi), or infliximab (Remicade)—between October 2001 and December 2014. Patients who previously received a biologic DMARD—adalimumab, certolizumab pegol, etanercept, golimumab, infliximab, tocilizumab (Actemra), anakinra (Kineret), abatacept (Orencia), or rituximab (Rituxan)—or the Janus kinase inhibitor tofacitinib, were excluded. Patients were required to have at least 1 follow-up visit (designated the 6-month visit) in the Corrona registry within a 3- to 9-month window of TNF inhibitor initiation, and to have CDAI assessment data at TNF inhibitor initiation. Patients who started a TNF inhibitor therapy between registry visits and did not have baseline disease activity measurements available were excluded from this analysis. In addition, patients who did not have a follow-up visit within the prespecified follow-up period, or did not have complete disease activity information despite a follow-up visit at the time of this analysis, were excluded, along with patients with delayed, erroneous, or missing disease activity information. The current analysis is focused on patients who, despite inadequate response after 6 months of treatment with the initial TNF inhibitor, continued with the same treatment for an additional 6 months. Disease activity at 6 and 12 months was evaluated using the CDAI, and disease response was defined as achievement of low disease activity or remission (ie, CDAI score ≤10). We excluded patients for whom a registry visit did not occur at the prespecified study interval, did not have complete disease activity data, or had PRO data that had not undergone quality control. Descriptive characteristics were calculated for categorical variables using STATA software, version 14 (StataCorp; College Station, TX), and the mean and standard deviations (SDs) for continuous variables, with the exception of skewed distributions, for which median and interquartile range were also reported. Of the patients enrolled in the Corrona registry, 5339 were biologic naïve and initiated treatment with a TNF inhibitor between October 2001 and December 2014. Of these, 2901 (54.3%) patients received an initial TNF inhibitor while having moderate or high disease activity (CDAI score >10). Subsequently, 619 patients were excluded from the analysis: 274 patients did not have a 6-month follow-up visit within the prespecified period, 268 patients were lost to follow-up, and 77 patients did not have disease activity information available at the time of this analysis. In total, 2282 patients were, therefore, included in this analysis. 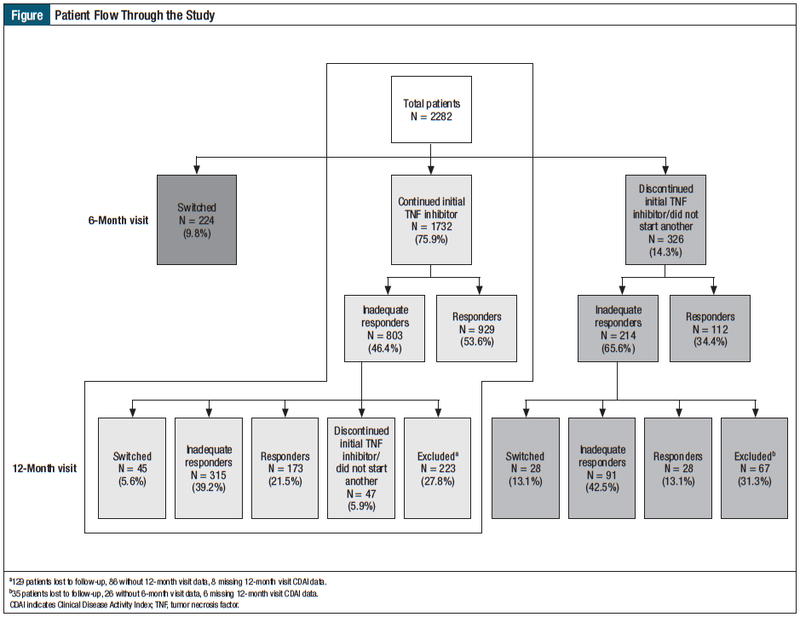 Patient flow through the study is shown in the Figure. Patients who did not continue to use the initially chosen TNF inhibitor for at least 6 months are only briefly described here: within 6 months of TNF inhibitor initiation, 9.8% (224/2282) of patients had switched to another biologic DMARD, and 14.3% (326/2282) had discontinued their initial TNF inhibitor without immediately switching to another biologic DMARD or to a targeted synthetic DMARD (Figure). At 6 months, the majority (75.9% [1732/2282]) of patients continued to use the same TNF inhibitor. These patients’ baseline and disease characteristics are shown in Table 1. Most (74.7%) patients were female, with a median age of 56 years and a median disease duration of 3 years. The most frequently initiated TNF inhibitors were adalim­umab (32.2%), etanercept (31.2%), and infliximab (29.2%); most (86.7%) patients received combination TNF inhibitor therapy, and approximately 50% of these patients received methotrexate. 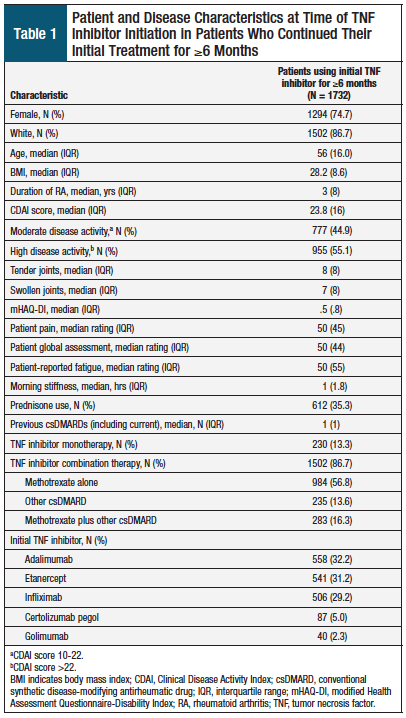 At 6 months, 803 of 1732 (46.4%) patients did not have an adequate response (CDAI score >10) to the initial TNF inhibitor compared with 929 (53.6%) patients who met the criteria for response (low disease activity or remission, CDAI score ≤10; Table 2). At treatment initiation, disease activity based on the CDAI score was similar (albeit slightly lower) in patients who had a response to treatment compared with those who had an inadequate response to treatment at the 6-month visit (Table 2). For the 803 patients who did not respond to treatment at 6 months, the mean improvement in CDAI score since treatment initiation was 7.9 (SD, 13.4) and 312 (38.9%) of these patients achieved the minimal clinically important difference CDAI score. Among the 929 patients who responded to treatment at 6 months, the mean improvement in CDAI score since treatment initiation was 19.5 (SD, 11.5), and 881 (94.8%) of these patients achieved the minimal clinically important difference CDAI score (Table 2). Numerically greater improvements in all PRO measures from treatment initiation to the 6-month visit were observed for patients who had a response compared with those who had an inadequate response (Table 2). 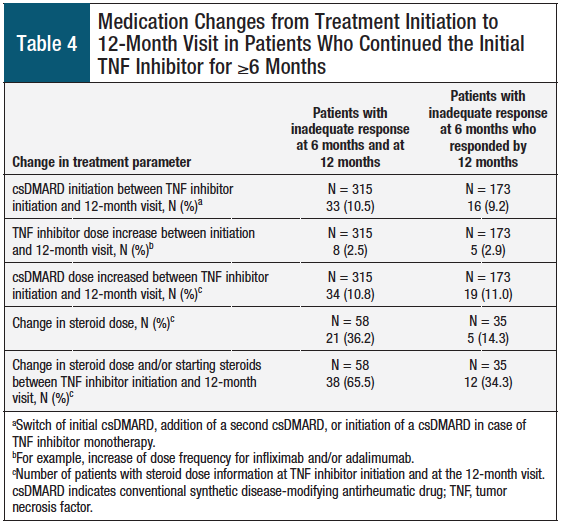 Patients who continued to use their initial TNF inhibitor for at least 6 months and had an inadequate response (CDAI score >10; N = 803) were followed for an additional 6 months (ie, 12-month analysis), provided that they had a visit to the registry with full disease activity data available at the time of the visit. Of these 803 patients, 223 (27.8%) were excluded from the 12-month analysis: 86 patients did not have a follow-up registry visit at 12 months, 129 patients were lost to follow-up, and 8 patients had missing disease activity data at the time of the analysis. Of the remaining 803 patients at the 12-month visit, 47 (5.9%) had discontinued the use of their initial TNF inhibitor but had not started another biologic DMARD (Figure), and 45 (5.6%) had switched to another biologic DMARD. Of the 488 patients who had an inadequate response at the 6-month visit and continued to receive their initial TNF inhibitor, 315 (64.5%) still did not have a response at the 12-month visit, whereas 173 (35.5%) achieved a response by their 12-month visit. We performed a comparison between patients who had inadequate response at the 6-month visit and either achieved or did not achieve a response at the 12-month visit. At the initiation of the initial TNF inhibitor, CDAI score was higher among patients who had an inadequate response at the 6- and 12-month visits compared with those who had an inadequate response at the 6-month visit but then had a response at the 12-month visit. The mean change from baseline in CDAI score at month 12 was 9.4 (SD, 13.6) and 20.7 (SD, 13.5), respectively (Table 3). At the 12-month visit, 44.8% of patients with an ­inadequate response at the 6- and the 12-month visit achieved minimal clinically important difference CDAI score versus 90.2% of patients who had a response at the 12-month visit. 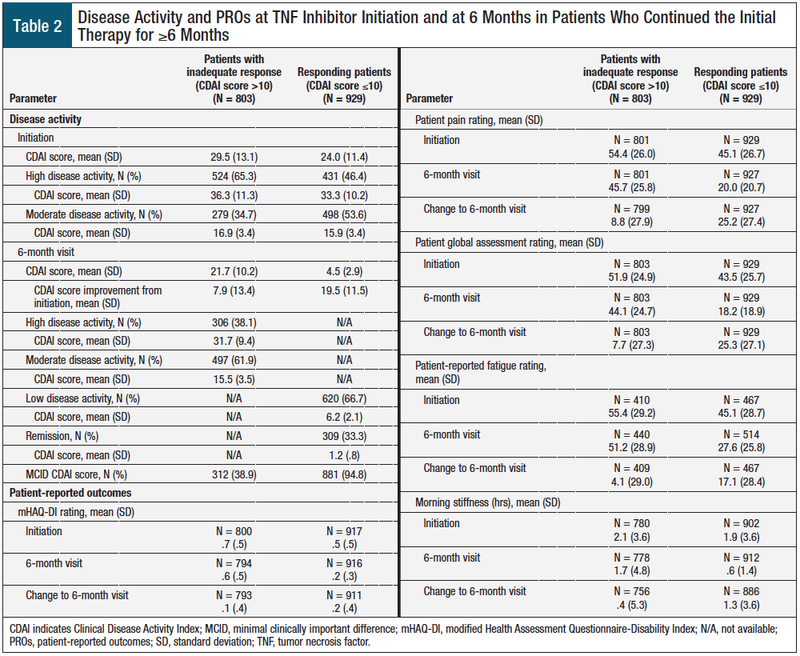 Changes in all PRO measures from TNF inhibitor initiation to the 12-month visit were numerically greater in those patients who had an inadequate response at the 6-month visit and then had a response to treatment at the 12-month visit compared with patients who continued to have an inadequate response at the 12-month visit (Table 3). Medication changes (ie, switching, discontinuing, or adjusting any treatment) from treatment initiation to the 12-month visit for the 2 groups of patients are presented in Table 4. Of the 488 patients who continued to use their initial TNF inhibitor, approximately 10% (N = 49) started treatment with a csDMARD between the TNF inhibitor initiation and their 12-month visit, regardless of their response status. Numerically higher proportions of patients who had an inadequate response at the 6-month visit and who did not have a response at the 12-month visit adjusted their dose of steroid and/or initiated steroid treatment compared with patients who had an inadequate response at the 6-month visit and then had a response at the 12-month visit. By using data from a large number of patients with RA enrolled in the US-based Corrona registry, our analysis allowed for monitoring of real-world patients at regular intervals to obtain data on patient and disease characteristics during routine clinical care. The results demonstrate that a considerable proportion (46.4%) of patients receiving an initial TNF inhibitor for at least 6 months had an inadequate response to therapy. Of patients who continued to receive their initially chosen TNF inhibitor treatment at the 12-month visit despite an inadequate response at the 6-month visit, the majority (64.5%) continued to have an inadequate response (vs 35.5% who demonstrated treatment response at the 12-month visit) but did not switch to an alternative biologic DMARD. In addition, acceleration of treatment (eg, addition or increase in the dose of concurrent csDMARDs or TNF inhibitor) was not more frequent among those with an inadequate response compared with those with a response. Therefore, a considerable number of patients in the real world who had inadequate response to their initial TNF inhibitor nevertheless continued to use the same treatment for up to 12 months without switching to another biologic DMARD. 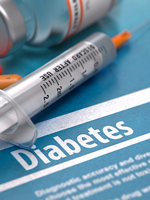 Evaluation of PROs at 6 and 12 months did not show a statistical difference, but did reveal a numerical difference at 6 and 12 months in favor of disease activity among patients who responded to treatment. As seen in Table 2, patients with inadequate response at the 6-month visit had a higher baseline CDAI score compared with patients who responded at the 6-month visit (29.5 vs 24.0), and had a mean decrease in CDAI score of 7.9 from treatment initiation to the 6-month visit. It is possible that the small improvements among those with an inadequate response seen in this study were deemed by the physician and/or the patient to be “satisfactory” or “sufficient” to continue treatment with the same TNF inhibitor for an additional 6 months. However, even if this were the case for the 38.9% of patients in this group who achieved the minimal clinically important difference CDAI score, it does not explain why treatment was not accelerated for patients who did not attain the minimal clinically important difference. Other reasons may include delays in biologic DMARD prior authorization approval by health insurers, increased out-of-pocket patient costs, and late adoption of the treat-to-target principles by physicians; however, our analysis did not address these questions and further analysis would be required to ascertain the significance of these factors. In our analysis, changes in PRO measures were numerically greater in patients who had a response at the 6-month visit compared with patients with an inadequate response; this difference was also apparent at the 12-month visit, but again without a statistical significance. Longer-term follow-up may be needed to demonstrate statistical significance between these patients. Of note, for patients who continued to have an inadequate response throughout the follow-up period, little attempt was made to accelerate treatment (eg, addition of steroids, TNF inhibitor dose increases, or addition of more csDMARDs) to achieve disease remission. In addition, barriers to the implementation of treat-to-target principles have been identified in a recent US clinical trial, which focused on feasibility of acceleration as a co-primary end point and identified patient and physician impediments to adopting more aggressive treatments.10 We believe that elucidation of the reasons for resisting a treat-to-target approach in the Corrona registry would help to reveal the real-world barriers to universal adoption of this approach. It is, therefore, apparent that clinicians need to guide and mentor patients to explore “system 2” through careful coaching and support. It is only when patients engage in deeper consideration in “system 2” that more widespread adoption of more effective treatment is likely to occur. Thus, the burden is on the provider to deliver more than superficial guidance and recommendations. From a payer’s perspective, switching between multiple therapies because of intolerance or inadequate response to treatment adds complexity to treatment management and formulary design.29 Comparative effectiveness studies comparing patients switching from the first TNF inhibitor to the second TNF inhibitor with those who switch from the first TNF inhibitor to a non–TNF inhibitor biologic DMARD are needed to shed more light on the uncertainties about next steps for patients who have an inadequate response to TNF inhibition and to provide crucial data to payers. Limitations of the current study include the relatively short 12-month analysis period, and the fact that patient preferences were not captured for instances when the physician recommended accelerating treatment but the patient did not give consent or was unwilling to accept the risk of new treatment. In addition, adherence to treatment was not evaluated, unlike in the recently published Corrona TRACTION study.27 It is possible that physicians in the current study did not accelerate treatment more frequently in patients who were nonadherent, because of the anticipation that improved adherence would improve their outcomes. Medication adherence may also explain why some patients did not have a response at the 6-month visit but did have a response at the 12-month visit. Furthermore, we did not compare the response rates at the 12-month visit between the 6-month visit responders and the nonresponders; it is possible, therefore, that some patients who had a response at the 6-month visit had no response at the 12-month visit. The strength of this real-world study is that patients were recruited from the largest US-based RA registry of patient- and physician-derived data without limitations in disease duration. This study is the first, to our knowledge, to specifically evaluate delays in adjustment of treatment after initiation of the first biologic agent. The findings demonstrate that a considerable proportion of patients with RA did not have a response to their initial TNF inhibitor treatment 6 or 12 months after treatment initiation, and many continued to have moderate or severe disease activity, without accelerating treatment. This suggests that in real-world clinical practice, despite the current focus on treat-to-target principles, a substantial number of patients with RA who have active disease continue to use the initial TNF inhibitor, without switching or adjusting their medication, despite suboptimal clinical outcomes. To effectively implement treat-to-target principles in clinical practice, there is a critical need for physicians to focus on patients who continue to use ineffective treatment, by improving awareness of the dynamics of patient decision-making and to deconstruct the fear of “loss” by creating a kind, informative, and supportive environment. Karleen Nicholson, PhD, and Richard Knight, PhD, of Complete Medical Communications, Macclesfield, United Kingdom, provided medical writing support. This study was sponsored by Corrona, LLC, and funded by Pfizer Inc. Corrona has contracts with AbbVie, Amgen, AstraZeneca, Boehringer Ingelheim, Bristol-Myers Squibb, Crescendo, Eli Lilly, Genentech, GlaxoSmithKline, Horizon Pharma USA, Janssen, Momenta Pharmaceuticals, Novartis, Pfizer, Roche, and UCB. Dr Pappas is an employee and stockholder of Corrona; Dr Gerber, Dr Gruben, and Dr Geier are employees and stockholders of Pfizer; Dr Litman and Ms Hua are employees of Corrona; Dr Chen and Dr Andrews are employees of Pfizer; Dr Li reported no conflicts of interest; Dr Kremer is an employee of Corrona, and is on the advisory boards of AbbVie, Bristol-Myers Squibb, Genentech, Lilly, Novartis, and Pfizer; Dr Bourret is an employee of Pfizer. Dr Pappas is Scientific Director of International Registry and Comparative Effectiveness and Biomarkers Sub-Study, Corrona, Waltham, MA, and Assistant Professor of Medicine, Department of Medicine, Columbia University, New York City; Dr Gerber is Senior Director, Health Economics and Outcomes Research, Pfizer, Groton, CT; Dr Litman is Associate Director of Biostatistics, Corrona; Dr Gruben is Statistician, Pfizer, Groton, CT; Dr Geier is Director of Epidemiology, Pfizer, New York City; Ms Hua is Biostatistician, Corrona; Dr Chen is Senior Medical Director, Global Medical Affairs, Pfizer, New York City; Dr Li is Biostatistician III, University of Massachusetts Medical School, Worcester; Dr Kremer is Chief Medical Officer, Corrona, and Professor of Medicine, Albany Medical College, NY; Dr Andrews is Senior Director, US Medical Affairs, Pfizer, Collegeville, PA; Dr Bourret is Senior Director, North America Medical Affairs, and Medical Lead, Specialty Payer & Channel Customer Strategy, Pfizer, Collegeville, PA.
1. World Health Organization. 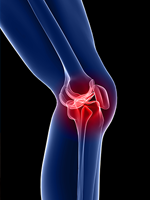 Chronic rheumatic conditions: Rheumatoid arthritis. www.who.int/chp/topics/rheumatic/en/. Accessed April 9, 2018. 2. Singh JA, Saag KG, Bridges SL Jr, et al. 2015 American College of Rheumatology guideline for the treatment of rheumatoid arthritis. Arthritis Rheumatol. 2016;68:1-26. 3. Smolen JS, Landewé R, Bijlsma J, et al. EULAR recommendations for the management of rheumatoid arthritis with synthetic and biological disease-modifying antirheumatic drugs: 2016 update. Ann Rheum Dis. 2017;76:960-977. 4. Smolen JS, Burmester GR, Combe B, et al. 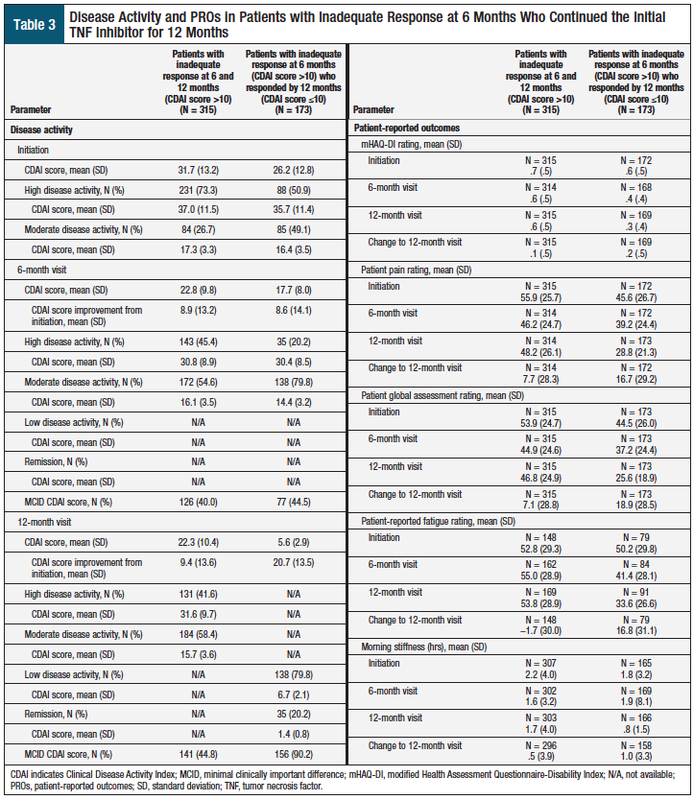 Head-to-head comparison of certolizumab pegol versus adalimumab in rheumatoid arthritis: 2-year efficacy and safety results from the randomised EXXELERATE study. Lancet. 2016;388:2763-2774. Errata in: Lancet. 2016;388:2742; Lancet. 2017;389:e2. 5. Chastek B, Becker LK, Chen CI, et al. Outcomes of tumor necrosis factor inhibitor cycling versus switching to a disease-modifying anti-rheumatic drug with a new mechanism of action among patients with rheumatoid arthritis. ­J Med Econ. 2017;20:464-473. 6. Navarro-Millán I, Curtis JR. Newest clinical trial results with antitumor necrosis factor and nonantitumor necrosis factor biologics for rheumatoid arthritis. Curr Opin Rheumatol. 2013;25:384-390. 7. Harrold LR, Harrington JT, Curtis JR, et al. Prescribing practices in a US cohort of rheumatoid arthritis patients before and after publication of the American College of Rheumatology treatment recommendations. Arthritis Rheum. 2012;64:630-638. 8. Kotak S, Koenig AS, Collier DH, et al. Disease activity and treatment strategies in moderate rheumatoid arthritis patient population: data from the Consortium of Rheumatology Researchers of North America. Arthritis Rheum. 2012;64(10 suppl):Abstract 1842. 9. Yu Z, Lu B, Agosti J, et al. Implementation of treat to target for rheumatoid arthritis in the US: analysis of baseline data from the TRACTION trial. Arthritis Care Res (Hoboken). 2018:70;801-806. 10. Harrold LR, Reed GW, John A, et al. Cluster-randomized trial of a behavioral intervention to incorporate a treat-to-target approach to care of US patients with rheumatoid arthritis. Arthritis Care Res (Hoboken). 2018;70:379-387. 11. Grigor C, Capell H, Stirling A, et al. Effect of a treatment strategy of tight control for rheumatoid arthritis (the TICORA study): a single-blind randomised controlled trial. Lancet. 2004;364:263-269. 12. Vermeer M, Kuper HH, Hoekstra M, et al. Implementation of a treat-to-target strategy in very early rheumatoid arthritis: results of the Dutch Rheumatoid Arthritis Monitoring remission induction cohort study. Arthritis Rheum. 2011;63:2865-2872. 13. Verstappen SM, Jacobs JW, van der Veen MJ, et al; for the Utrecht Rheumatoid Arthritis Cohort study group. Intensive treatment with methotrexate in early rheumatoid arthritis: aiming for remission. Computer Assisted Management in Early Rheumatoid Arthritis (CAMERA, an open-label strategy trial). Ann Rheum Dis. 2007;66:1443-1449. 14. Solomon DH, Bitton A, Katz JN, et al. Review: treat to target in rheumatoid arthritis: fact, fiction, or hypothesis? Arthritis Rheumatol. 2014;66:775-782. 15. Orlewska E, Ancuta I, Anic B, et al. Access to biologic treatment for rheumatoid arthritis in Central and Eastern European (CEE) countries. Med Sci Monit. 2011;17:SR1-SR13. 16. Kaló Z, Vokó Z, Östör A, et al. Patient access to reimbursed biological disease-modifying antirheumatic drugs in the European region. J Mark Access Health Policy. 2017;5:1345580. 17. Laires PA, Exposto F, Mesquita R, et al. Patients’ access to biologics in rheumatoid arthritis: a comparison between Portugal and other European countries. Eur J Health Econ. 2013;14:875-885. 18. Centers for Medicare & Medicaid Services. 2016 RA Measures Group for PQRS Reporting. www.cms.gov/Medicare/Quality-Initiatives-Patient-Assessment-Instruments/PQRS/downloads/PQRS_2016_Measure_List_01072016.xlsx?agree=yes&next=Accept?agree=yes&next=Accept. Accessed January 2, 2018. 19. Curtis JR, Chen L, Bharat A, et al. Linkage of a de-identified United States rheumatoid arthritis registry with administrative data to facilitate comparative effectiveness research. Arthritis Care Res (Hoboken). 2014;66:1790-1798. 20. Kremer JM. The Corrona US registry of rheumatic and autoimmune diseases. Clin Exp Rheumatol. 2016;34(5 suppl 101):S96-S99. 21. Curtis JR, Yang S, Chen L, et al. Determining the minimally important difference in the Clinical Disease Activity Index for improvement and worsening in early rheumatoid arthritis patients. Arthritis Care Res (Hoboken). 2015;67:1345-1353. 22. Maska L, Anderson J, Michaud K. Measures of functional status and quality of life in rheumatoid arthritis: Health Assessment Questionnaire Disability Index (HAQ), Modified Health Assessment Questionnaire (MHAQ), Multidimensional Health Assessment Questionnaire (MDHAQ), Health Assessment Questionnaire II (HAQ-II), Improved Health Assessment Questionnaire (Improved HAQ), and Rheumatoid Arthritis Quality of Life (RAQoL). Arthritis Care Res (Hoboken). 2011;63(suppl 11):S4-S13. 23. Hawker GA, Mian S, Kendzerska T, French M. Measures of adult pain: Visual Analog Scale for Pain (VAS Pain), Numeric Rating Scale for Pain (NRS Pain), McGill Pain Questionnaire (MPQ), Short-Form McGill Pain Questionnaire (SF-MPQ), Chronic Pain Grade Scale (CPGS), Short Form-36 Bodily Pain Scale (SF-36 BPS), and Measure of Intermittent and Constant Osteoarthritis Pain (ICOAP). Arthritis Care Res (Hoboken). 2011;63(suppl 11):S240-S252. 24. Nikiphorou E, Radner H, Chatzidionysiou K, et al. Patient global assessment in measuring disease activity in rheumatoid arthritis: a review of the literature. Arthritis Res Ther. 2016;18:251. 25. Kirwan JR, Minnock P, Adebajo A, et al. Patient perspective: fatigue as a recommended patient centered outcome measure in rheumatoid arthritis. J Rheumatol. 2007;34:1174-1177. 26. van Nies JA, Alves C, Radix-Bloemen AL, et al. Reappraisal of the diagnostic and prognostic value of morning stiffness in arthralgia and early arthritis: results from the Groningen EARC, Leiden EARC, ESPOIR, Leiden EAC and REACH. Arthritis Res Ther. 2015;17:108. 27. Solomon DH, Losina E, Lu B, et al. Implementation of treat-to-target in rheumatoid arthritis through a learning collaborative: results of a randomized controlled trial. Arthritis Rheumatol. 2017;69:1374-1380. 28. Kahneman D. Thinking, Fast and Slow. New York: Farrar, Straus and Giroux; 2011. 29. Lee J, Pelkey R, Gubitosa J, et al. Comparing healthcare costs associated with oral and subcutaneous methotrexate or biologic therapy for rheumatoid arthritis in the United States. Am Health Drug Benefits. 2017;10(1):42-49. Recent formulary trends, however, may not have that intended impact. For example, charging more for high-value maintenance medications may lead to increased expenses over time. 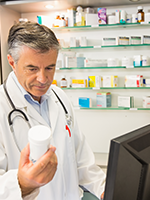 Formulary exclusions have been increasing and can be problematic when a payer or a PBM excludes a brand-name drug in favor of a therapeutic equivalent that is chemically different from the brand-name drug and may work in a different manner in a patient’s body. The excluded brand-name drug could provide a high-value alternative for certain patients.1 This is especially true in rheumatoid arthritis (RA). In 2014, the American College of Rheumatology (ACR) began working on new treatment guidelines for RA, and the key recommendations were presented at the ACR 2016 Annual Meeting, where the panel strongly recommended a treat-to-target strategy.2 The management of patients with RA is a critical area for payers, but current formulary designs may not support the new RA guidelines. Despite the availability of multiple treatment options, the definition of successful treatment remains vague. Furthermore, patients with RA often switch between multiple treatments, which may complicate the development of therapeutic guidelines and the design of managed care formularies. PROVIDERS/PAYERS: The study by Pappas and colleagues in this issue has demonstrated the need to reevaluate patients’ responses to initial RA therapy at 6 and 12 months.3 Providers and payers should work together to support patients with RA, using the treat-to-target principles. These agreements should include developing treatment protocols that review patients’ response to therapy at 6 and 12 months and provide advanced therapy to reduce the risk for joint and organ damage. Accelerating treatment options will require payers to provide patient access to treatments as outlined in the treatment protocols. RA continues to present clinical and economic challenges to patients, physicians, and payers; these challenges, along with the constantly evolving market access marketplace, make this an exciting time to expand the dialogue about this disease and new treatment protocols. 1. Miller S. Restrictive formularies and drug exclusions: in whose interest? Society for Human Resource Management. Updated November 20, 2014. www.shrm.org/hrdisciplines/benefits/articles/pages/drug-formularies-exclusions.aspx. Accessed May 4, 2018. 2. Harrison P. New rheumatoid arthritis guidelines in the works for 2015. Medscape. November 27, 2014. www.medscape.com/viewarticle/835584#vp_1. Accessed May 4, 2018. 3. Pappas DA, Gerber RA, Litman HJ, et al. Delayed treatment acceleration in patients with rheumatoid arthritis who have inadequate response to initial tumor necrosis factor inhibitors: data from the Corrona registry. Am Health Drug Benefits. 2018;11(3):148-158.